If you set a group of year nine pupils a challenge, it is striking how creative they can be. In a brainstorm, it always impresses me how they are able to immediately think laterally and intuitively, pulling in reference points from their friends, family, their environment and their use of modern technologies like social media. Having run similar sessions with groups of experienced executives, it is fascinating to see that these students most accurately reflect the role of the CEO, who has to approach all new ideas with an open mind. 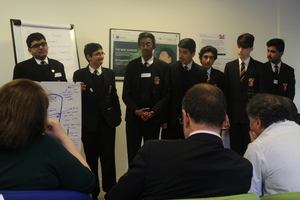 This was one of the discussion points at the latest ‘Insight Day’ held at the Cognizant London offices earlier this month, in conjunction with Teach First and attended by students from five schools in the Hounslow area. As part of Cognizant’s STEM/STEAM (Science, Technology, Engineering, Arts and Maths) initiative designed to get children enthused about science and technology subjects, the pupils brainstormed wearable technology ideas, coming up with genuinely perceptive innovations. These included a football shin-pad with a chip to highlight diving or injuries, and a hat for explorers with GPS and a panic button synced with rescue operations. As part of the panel at the event, I was astonished at the creativity exhibited by the pupils and the energy and enthusiasm they showed in brainstorming and presenting business ideas. This type of initiative is hugely important if we are to actively tackle the STEM/STEAM skills shortage in the UK. Figures from 2013 from the Digital Skills for Tomorrow revealed that around 745,000 additional workers with digital skills will be needed to meet the rising demands between 2013 and 2017 in the UK, with 900,000 vacancies across Europe by 2020 according to European Commission numbers. In order to meet this shortfall, it is essential that businesses and schools work together to engage students at an early age by demonstrating the variety and range of career options available to them. Brainstorming STEM/STEAM ideas with relevance to the students’ everyday lives certainly helps, but in fact just travelling to Canary Wharf and getting a taste of office life – even if just for one day – can be a real eye opener. Running the session outside of the school environment also helps it to be memorable. Since the Insight Day, the teachers involved have told us that the students remained engaged with the topic and even wanted to continue researching and brainstorming more ideas. Something else which was particularly encouraging was the role which the girls played in their teams. With daily reports that the STEM/STEAM skills shortfall is particularly acute amongst women who, despite making up 46 per cent of the UK’s work force, fill only 16% of IT and telecoms professional occupations, it was fantastic to see the girls at the event actively engaging with the discussions and often leading the presentations. With news also showing that less than 5% of girls in OECD countries contemplate pursuing a STEM/STEAM career, events which engage females at school age are crucial if we are to find greater balance in the future. Crucially, with over 75% of new jobs in the next five years requiring STEM/STEAM expertise, the industry must recognise the need to increase the number and diversity of students in these subjects, working alongside the education system to encourage them to enter this field. Days like these where we come together to give the pupils an opportunity to air their ideas in a setting like Cognizant shows them how their imagination can lead to significant results; as an outcome of this event, it is highly likely we will have seen at least one future entrepreneurial millionaire. Sparking new ideas is hugely rewarding and a proven way in which to encourage school children: one that should also inspire experienced business people to think a bit more like their inner 14 year old.